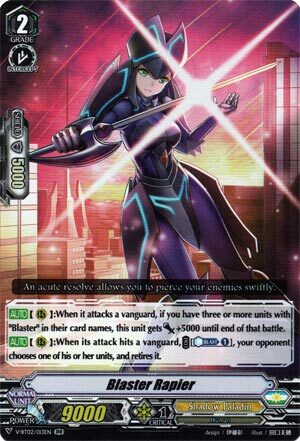 [AUTO](RC):When it attacks a vanguard, if you have three or more units with “Blaster” in their card names, this unit gets [Power]+5000 until end of that battle. [AUTO](RC):When its attack hits a vanguard, COST [Counter Blast (1)], your opponent chooses one of his or her rear-guards, and retires it. Lovely beatstick that can hit anything not called Nouvelle Vague unboosted (as long as you got three Blasters including this, so Phantom Blaster Dragon as the vanguard and any other Blaster on RG circle), and creates pressure to loosen up the opponent’s hand. Shame it’s only RG circle only for both skills, so it’s a lot easier to guard against since no trigger anticipation, but still solid. Nope, can’t think of any other reason not to run at a lot.